The debate continues on whether to remove the statues and rename the schools honouring Canada's first Prime Minister and the principle architect of Confederation, Sir John A. Macdonald. While the story was making headlines in Canada, I had the good fortune to be in Carlingford, Ireland. 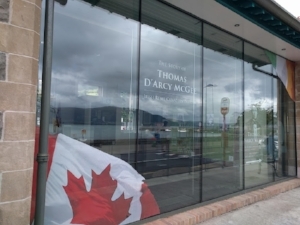 I was there for a conference centering around the achievements of Macdonald's colleague, Thomas D'Arcy McGee. Perhaps more than any other, he was responsible for making reconciliation a part of Canada's constitution. He helped imbed it as part of the Canadian psyche. McGee's life story is a narrative of reconciliation and redemption. As a young man, McGee was a fervent member of the Young Ireland movement, rebelling against the British Crown. In 1848, he tried to raise a force in Scotland to attack the British in Ireland. After the uprising's failure, he escaped to the United States. By 1857, when he and his family moved to Montreal, his views had changed profoundly. He upheld the British system of Constitutional Monarchy and the social cohesion he found in Canada. Among the nation-builders of Confederation, he was the most eloquent visionary and champion of what Canada could one day become. His ideas and his achievements are celebrated each August at a forum in his birthplace, the historic village of Carlingford, near the Irish Republic's border with Northern Ireland. 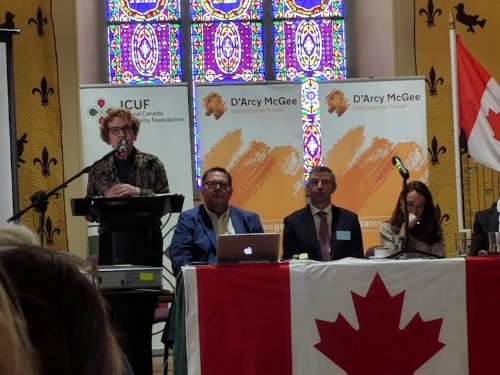 The D'Arcy McGee International Forum forum was the brain child of Canada's former Ambassador to Ireland, Loyola Hern, and is organized by the Irish Canada University Foundation, under the direction of Dr. James Kelly. But for the most part, the conference was not about history and biography; rather, it became a forum for contemporary ideas. "Reconciliation" was certainly at the heart of this discussion. One of the highlights was the presentation of The Thomas D'Arcy McGee Award by Ireland's Minister of State at the Department of Foreign Affairs, Ciaran Cannon, TD. This year, the Award was presented to the Canadian who played such a pivotal role in the Northern Ireland peace process and the Good Friday Agreement: General John de Chastelain. Few Irish people are aware of the towering achievements of D'Arcy McGee -- "Ireland's gift to Canada." At the same time, few Canadians are aware of how General de Chastelain's achievements as Chairman of the Independent International Commission on Decommissioning are seen as pivotal to peace and reconciliation in today's Ireland. He ensured that paramilitary groups on both the Loyalist and Republican sides in Northern Ireland turned in their weapons. In Ireland, General de Chastelain is a hero. In his quiet, unassuming way, the General made a few interventions in the discussions during the forum, particularly on the issue of Brexit and the possibility of a hard border as a result of Brexit. While there still remain people on both sides of the border who would resort to force to achieve their goals, none of the paramilitary groups have the public support they would require to renew the violence of the past. No matter what happens with the border as a result of Brexit, no one wants to see a return to the three decades of The Troubles. Ireland has now known 20 years of peace and a generation has grown up without any first-hand knowledge of the violence of the past. That's reconciliation. Grand Chief Norton spoke of a different view of North American history that saw European and Indigenous narratives proceeding on separate courses, like to boats linked to each other pulling upriver. He and his people regard themselves, not as citizens of Canada or the United States, but as sovereign people of "Turtle Island," which encompasses all Indigenous peoples across North America. For generations, the people of Turtle Island have declined to participate in the political institutions of the nation states, provinces and states that surround them. Many do not recognize the authority of those polities. Why should laws against smuggling tobacco, for example, apply to a people who, a half millennium ago, gave tobacco as a gift to the Europeans in the first place? Many Irish listeners were hearing, for the first time, the views that lie at the heart of much of the current discussion in Canada on reconciliation. The forum returned to these themes of reconciliation with Indigenous peoples several times: Professor Vianne Timmons analysis of the similarities between treatment of Indigenous peoples in Canada and the Travellers in Ireland; Professor Marc Andre Fortin's discussion of cultural appropriation of Indigenous stories; the reflections of James Maloney, MP, that the issues of reconciliation in Canada and Ireland touch on so many common points. The speakers were not always in agreement with one another. In fact, one of the features that made the forum so stimulating was the absence of received ideas and political correctness. Every idea was up for debate. That might be the result of bringing together people whose cultures at first glance seem so similar, but who, on closer analysis, are sharply divided. As the organizer, Dr. Kelly, observed, the forum is about opening up a conversation. Listen to one another. Trust the perspective of the other. And see what happens. During the breaks, I could go back to my B&B during the breaks and downloading the news from Canada. 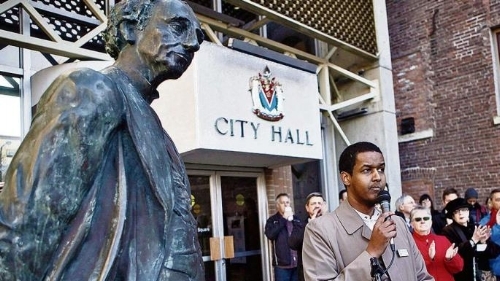 More developments in the controversy over removing Sir John A. Macdonald's statue from City Hall in Ireland -- and a call from The Times of London to see if I had any comment. More news about dissension and division on pipelines, refugee policy, tariffs, trade agreements, human rights in Canada and in Saudi Arabia. The news is always full of conflict and dissension; that's what makes it news. One of McGee's outstanding contributions to Canada was a way forward through the conflicts pitted Canadians against one another: French against English; Orangeman against Fenian; Maritimer against Upper Canadian. His solution for the sectarian dispute was to entrench minority rights -- Protestant schools in Quebec; Catholic schools in Ontario. During that same period, there were equally gifted statesmen of Indigenous peoples: Crowfoot, Poundmaker, and Big Bear to name just three who rose to prominence during the "opening" of the Canadian West -- or, as Grand Chief Norton might view it, the incursions into Turtle Island on the high plains of the Saskatchewan basin. But none of these Aboriginal leaders had a voice in the discussions. Now it's up to their descendants and the heirs of Turtle Island to reconcile what had been lost or overlooked or misunderstood in the building of Canada. Certainly the residential schools is one of the issues. But reconciliation cannot proceed in a spirit of demonizing the other side. It's not about revenge or retaliation -- taking down the statues of those whom others admire for achievements that all can celebrate. It's not about finding the cracks in the narrative where the darkness that resides in all humans resides. 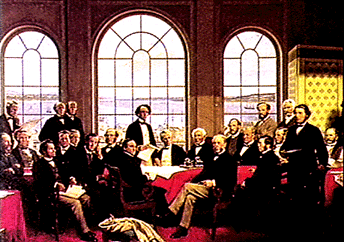 As Brian Lee Crowley pointed out in his recent essay for the Macdonald-Laurier Institute, "Nothing will dispel the appetite for reconciliation faster than the belief that Canadians who are justly proud of their country must hide these sentiments away and look on silently, while our founders are treated as criminals whose names must never be mentioned in polite company." Reconciliation requires openness, understanding, and the need to listen to the other. And the D'Arcy McGee International Forum in Carlingford, Ireland, was an excellent place for those conversations to take place.